At long last, Amaka got married to Obiora; even so, she was childless for the six years her marriage lasted. Her doctors declared her barren while her mother in-law harassed and distressed her out her husband's house. She left for Lagos to start afresh. She abode by her mother's advice "forget men, be pregnant, have your children and live an independent life. Take your sister Ayo as an example; even though she is not married, she has four children with a wealthy man (already married) who is in charge of their welfare. And indeed doing it well, it is far better to be a mother than to be a wife". In Lagos, she was involved with a number of men who helped her with important contracts from the government; thereby she made money hand over fist. Interestingly enough, one of those men was a Catholic priest, who was, in my opinion, special, interesting, curious and weird at the same time. You know, one of those fellows you aren't sure if to love or despise. However, Amaka did not care. For all that matters to her was to make hay while the sun shines. On the other hand, her mother still queried her about an evidence of her womanhood; that is, to be a mother. But, how can such a thing be possible if the doctors already told her she can never become pregnant. Moreover, adoption was out of the question. Furthermore, in her relationship with the man of God something went astray. Now, that the Catholic priest was in an important position as a director, would he abandon priesthood and take responsibility for his deeds? Would Amaka give marriage a second chance? Considering all she would benefit from him in his new position. Unquestionably, you would have to read the novel to find out. 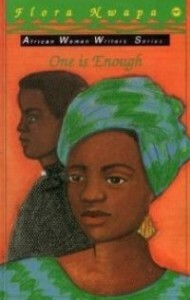 One is Enough was an enjoyable read; actually it only consists of 154 pages and certainly not brief in content. Most of the characters were pretty well developed, for instance: Obiora (Amaka's husband), Obiora's mother, Amaka's mother, Ayo (Amaka's sister), Adaobi (Amaka's childhood's friend), Mike (Adaobi's husband), Nanny (the poor woman who works in Amaka's house, once married with a German), Alhaji (one of Amaka's lovers), and of course the Catholic priest. The practice of twin killing that took place long time ago in Igboland was as well talked about. Sometimes I wish I existed when this story took place, most times I am happy it was the other way round. Life seemed to be somewhat rough in Lagos then. After the Biafran war, a deluge of bereaved Biafrans (mostly women) moved to Lagos where they had to fight an uphill battle in order to provide for their children. Normally, I have always had the greatest admiration for women in Flora's fiction; however, I am not certain about my feelings towards Amaka. Even though I enjoyed her story and rooted for her till the end. I officially proclaim myself a fan of Flora Nwapa. This is her third novel I have read so far. I am looking forward to reading all of her works. Her other two novels I have also read are Never Again and Women are different. I always like reading your reviews. I agree with Nana. Your reviews are great. I do think Amaka comes across as opportunistic. And the bit about the Catholic Priest. Is it an indictment on the Church? I do think so. Frankly I would love to read this. Afua, that was how I saw her sometimes, but most of the times... I do think she was dancing to the rythm of the drums. The society then was pretty corrupt... it was like use what you have to get what you want. Derogatively of course. The priest in a way.. does love the things of the world. I neither justify their deeds in any way nor do I judge them. This title looks entirely new to me. Well, I may have to fish it out then. Thanks, Mary. .. not new at all, it was published more than 30 years ago.. it is quite a womanly novel. However, I am sure you would enjoy it. hey, is there any chance to read this book online? I didn't find it in my country any help ? hey! not sure, trying buying it via Amazon.